Remarkable Showroom condition Young Chang super piano “The Pramberger” circa 2001. 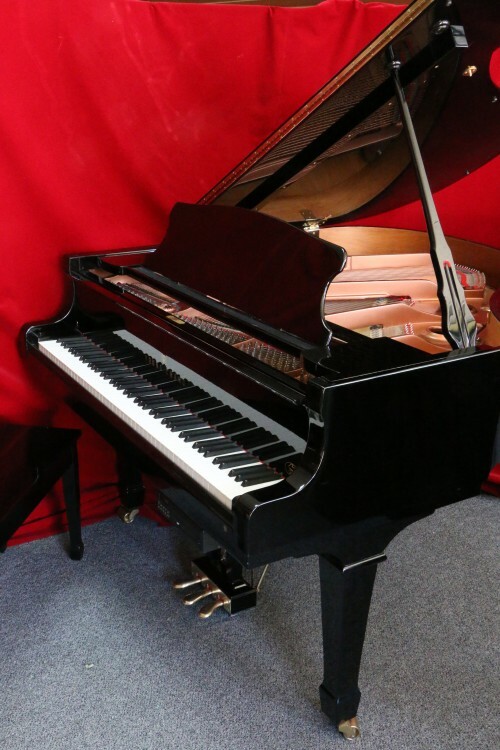 Designed by the famous Joseph Pramberger who was a Design Engineer for Steinway & Sons for 20 years before Young Chang hired him to improve the overall quality of their pianos and also create the “Pramberger”. Using premium quality materials and craftsmanship the Pramberger uses Renner hammers and action parts, Canadian Spruce “Bouldoc” soundboards and real sand cast iron plates unlike mass produced piano Vacuum Casting plates resulting in a fuller, richer tonal quality. Legend has it that Steinway sued Young Chang at one point because the Pramberger was using designs that were too similar to the Steinway and Sons design. The Pramberger is a fine looking, sounding and playing instrument. This one has gotten such little playing time the hammers barely have a groove. It was used as a show piece. Even the QRS Pianomation CD System ws rarely used. Free LI/NYC shipping. $475./most else continental USA. Warranty. Questions? Call Sonny 631 475-8046 or e-mail sonny or visit our websiteÂ http://sonnyspianotv.com to see more.